The design of a garment consists of several phases, all carried out with extreme thoroughness and accuracy. The first step is the designer’s sketch: the sketch represents the idea and the creativity of its creator. Through the meticulous teamwork of our highly skilled pattern makers, assisted by a group of specialists, the team is able to accurately and correctly interpret the development of a style and technically make a garment starting from a simple sketch, thereby optimizing production. 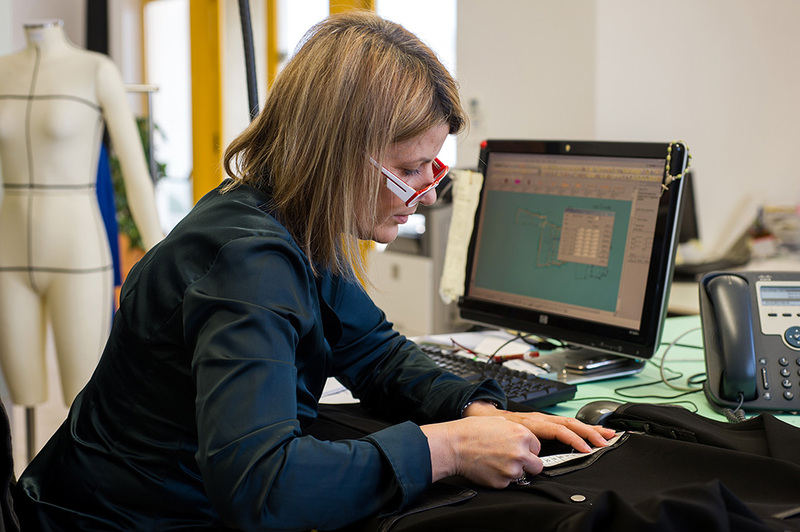 For each client, Barbetta dedicates a specific team that follows each step of garment construction: the study of the sketch, the preparation of the prototype, the implementation of the sample, mass production, sewing and delivery of finished product. The ability to study, research, propose materials and special sewing techniques and innovative cleaning for different garments is another critical element. Barbetta has integrated one machine for washing the garments with water and three machines for dry cleaning. This technology gives the fabric a soft hand feel, and minimizes twisting and pilling (the presence of small balls of fluffon the fabric surface). The design process, on the whole, is complex because it offers answers and solutions to every customer with respect to each specific creative and productive need. Customer satisfaction is the engine behind our motivation and performance.